Taekwon-Do is the scientific use of the body in the method of self defence. A body that has gained the ultimate use of it’s facilities through intensive physical and mental training. Translated from Korean, TAE literally means to jump, kick or smash with the foot, KWON means to destroy with the hand or fist and DO means the art, way or method. Therefore Taekwon-Do means foot, hand way. Korean martial arts began more than 2000 years ago and have evolved into what we know as Taekwon-Do. Today, Taekwon-Do has millions of followers throughout the world. It is considered to be one of the most effective forms of self defence when correctly applied, and is also a highly effective way of providing both mental and physical self development. 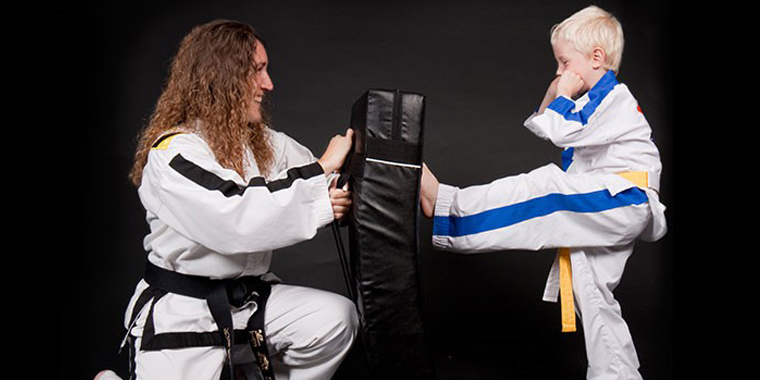 Kim Robinson started teaching her own classes in 2001, and the Integrity Martial Arts school in Sturminster Newton was established; the class has continued to grow to a great size over the years. Kim has now started her own club: KR Martial Arts. We are all very proud of the way our group is supported by wonderful students, parents and friends, and we’re also very lucky to have one other fantastic instructor who helps out every week, who also runs their own club elsewhere – Mr Sam Donohoo. It’s a joy to teach the kids and adults, including a wide range of age groups and we really feel our club will be running for many years to come. Everyone gets 2 free lessons first, so if you’re interested in seeing what we do just come along and see us! !